A popular pseudocereal of the Amaranthaceae family, quinoa (Chenopodium quinoa) dates back to the time of the Spanish conquistadors. The Inca people knew of its culinary value and preserved the tradition of cultivating quinoa despite being oppressed by European invaders. 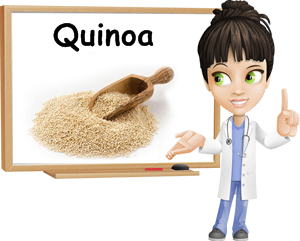 Quinoa is not a grain like wheat or corn, but a seed and a pseudo-cereal with a good nutritional profile and great benefits for one’s health. Rich in protein, it makes an ideal food for people living a vegetarian or vegan lifestyle because it helps meets protein requirements more than other plant sources. Actually, quinoa contains all 9 essential amino acids, being a source of complete protein, a characteristic that greatly recommends it for consumption. Essential amino acids are important because they help synthesize neurotransmitters in the brain that regular mood, appetite, sleep as well as have a big impact on hormone production with effects across multiple systems. Moreover, quinoa is gluten-free and rich in essential amino acids as well as a good source of B vitamins, iron, magnesium and phosphorus, a nutritional profile that adds to its benefits and nutritional value. What is quinoa? To put it simply, quinoa refers to the edible small, hard seeds of the grain with the same name. If you have never seen a quinoa crop, then let me tell you how beautiful a scenery it can be: yellow, green, orange, red and purple everywhere. Quinoa leaves, referred to as quinoa greens, are also edible, but not so popular as the seeds, hence their scarcity. What do quinoa seeds look like? Quinoa seeds are sesame-sized white, cream, red, brown and even purple or black hard, dry seeds. Despite this wide range of colors, supermarket or local market quinoa seeds are creamy-white. What does quinoa taste like? Quinoa seeds are quite palatable: they have a creamy and slightly crunchy or grainy texture and an appetizing nutty flavor which makes them really grow on you. You should easily find quinoa seeds, flour or flakes at your local grocery store. Although it is a pseudocereal (not a real cereal), you can cook and eat it just like an ordinary cereal. Quinoa flakes can replace breakfast oatmeal, while quinoa flour is great for pancakes and unleavened bred. But why choose quinoa over other healthy cereals such as oats, for example? 1) First of all, quinoa does not contain gluten. If you have a sensitivity to gluten or if you are suffering from either wheat allergy, intolerance or sensitivity or celiac (coeliac) disease, then you need to eat only gluten-free products. Gluten-sensitivity means that you experience mild to severe digestive problems such as nausea, bloating, gas, vomiting or diarrhea if you eat gluten. Wheat allergy means you experience allergic symptoms when either ingesting or being in the presence of wheat which, of course, contains gluten as well. Celiac disease basically means your small intestine reacts badly when you eat products that contain gluten. Symptoms of celiac disease include severe bloating, diarrhea or constipation, anemia, vitamin and mineral deficiencies, bowel inflammation, weight loss and so on. Quinoa, buckwheat and amaranth are ideal if you are suffering from any of the above-mentioned conditions. 2) Compared to other (pseudo)cereals, quinoa is a good source of quality protein: 14% protein/ 100 g of uncooked seeds. If you are leading a vegetarian or vegan lifestyle and cannot eat meat, then you can partially meet your body’s protein demands by eating quinoa. 3) Unlike many cereals, quinoa is a great source of amino acids, vital compounds required for staying in good health. Because it contains all 9 essential amino acids, it is considered as being a complete protein and thus highly nutritious. 4) Quinoa boast a good nutrition profile, with a moderate vitamin and mineral content. For instance, it is a good source of thiamine, riboflavin, pyridoxine and folate, B vitamins which help our body convert carbohydrates, fats and proteins into usable energy, aid digestion and support brain and nervous system health. Folate in particular is essential during both before and during pregnancy because it boosts fertility and ensures the proper development of the baby’s spine and head. Quinoa is also a great source of iron, magnesium, phosphorus and zinc. Regular consumption helps with the prevention and treatment of anemia, supports muscle health, including cardiac muscle health and increases calcium absorption in bones. It promotes healthy bones and teeth, prevents tremors, weight loss and extrasystoles as well due to a good phosphorus content. The zinc in quinoa seeds contributes to good immunity. 5) According to researchers, quinoa appears to be rich in trimethylglycine, a natural compound said to protect DNA and have anti-aging as well as anti-tumor properties. Trimethylglycine is also found in wheat bran, spinach and beetroot. 6) With 7 g of fiber/100 g of seeds, quinoa contributes to improving intestinal motility and relieving constipation. This not only helps maintain colon health, but also help manage hemorrhoids symptoms as a result of its overall beneficial action on the digestive system. Aside from taste, availability and good nutritional profile, you might prefer quinoa over other cereals at times because of its short cooking time. After rinsing it once or twice, boil it for 10-15 minutes and it’s done. Rinsing is necessary because quinoa seeds contain compounds called saponins which give the seeds a bitter taste. Although commercially available quinoa is most likely processed to remove the saponins coating, one more rinsing won’t hurt. Saponins are slightly toxic and will cause unpleasant allergy-like reactions. Even if you are not gluten-intolerant, quinoa might be good for you because it is easier to digest than other cereals such as wheat.